Much of the company's success has to do with its online marketplace. Over the last couple of years, Home Depot (NYSE:HD) stock has been beating the broader stock market. Helped by a recovering housing market and families spending money on their homes again, home improvement stores in general have seen a surge in business in the last two years. 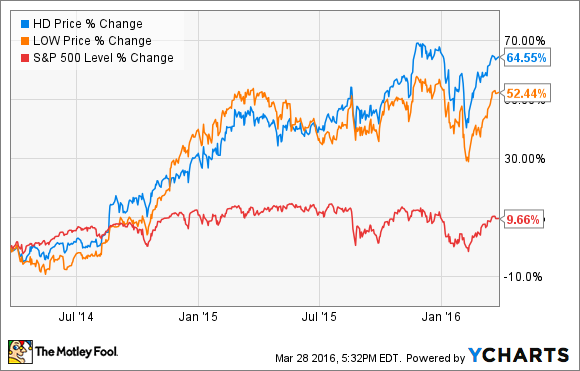 Home Depot, though, has also been outperforming its biggest competitor Lowe's (NYSE:LOW). What has the big orange home improvement superstore been doing right that the competition is missing out on? Data source: Home Depot's and Lowe's fourth-quarter 2015 earnings reports. What was the reason for these increases in revenue and profit? The company saw strong comparable-store sales growth, especially in the U.S., with an increase of 7.1% over 2014. Lowe's posted an increase as well but lagged behind at only 5.1% U.S. comparable-stores sales growth. Lowe's also saw revenue and profit get hit by its exit from its Australian joint venture in 2015. Home Depot attributed the strong increase across the board to its online business. The company has been dedicated to integrating its online store with its physical stores over the last few years. How has it been able to do this? It's easy for any business to invest in an online shopping experience and pay for advertising to get Internet traffic flowing to it. In fact, if you go to both Home Depot and Lowe's websites or mobile sites, the two competing online stores look and feel very similar. So, what has set Home Depot's online capabilities apart from the competition? The first differentiator is that Home Depot has the biggest full-service home improvement store presence in the U.S. As of the end of 2015, the company had 2,274 stores, compared with 1,857 for Lowe's. With more physical stores, customers looking for an in-store experience or a pick-up-in-store online order option are more likely to choose a store that's close to them. The second is that the company has invested heavily in supply chain and logistics technology. Back in 2012, Home Depot purchased a data analysis and pricing company to help make merchandise decisions and product price reduction decisions. Over the last two years, the home improvement store has also rolled out tools for its associates to be able to locate items in stores more quickly, introduced new customer ordering options like in-store scheduled pick-up, and integrated third-party company installers into the company's communication system to enhance responsiveness to customers. In 2015, Home Depot also announced that a new supply chain synchronization system it had been piloting would be extended to new markets to increase sales efficiency and increase product delivery times. Home Depot is far outpacing its biggest competitor Lowe's in all categories. At nearly 8%, Home Depot's bottom-line profit margin is nearly double the margin Lowe's has been able to manage. Both at the operating level and on the bottom line, Home Depot has been more efficient. Home Depot has also been demonstrating good management of company assets -- physical stores as well as its online capabilities -- and investors' dollars as shown in its return on assets (how well a management team is utilizing company assets to generate profit) and return on equity (profit returned to shareholders in relation to the amount shareholders have invested) ratios. It's obvious Home Depot's focus on integrating its physical stores with its online presence and all related business activities has been paying off. Despite consumers shopping more online, the country's largest home improvement store has demonstrated its ability to adapt to and thrive in today's new marketplace.